Posted February 8, 2010 by John Duffy MPSI, Claregalway Pharmacy in Features. A cramp pain typically lasts a few minutes. In some cases it lasts just seconds, but in some cases it lasts up to ten minutes. The severity of the pain varies. 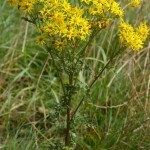 The muscle may remain tender for up to 24 hours after a leg cramp. Leg cramps usually occur when you are resting—most commonly at night when in bed (they are often called night cramps). They may wake you. It can become a distressing condition if your sleep is regularly disturbed. Many people have an occasional leg cramp. However, they occur frequently in some people. They are more common in older people. About 1 in 3 people over the age of 60, and about half of people over the age of 80, have regular leg cramps. About 4 in 10 people who have leg cramps have at least three per week. They occur every day in some people. Pregnancy—usually in the later stages. Note: leg cramps are different to a condition called restless legs syndrome. In this condition the legs can be uncomfortable, you feel creeping sensations in the legs, and it is relieved by walking about. Stretching and massaging the affected muscle can usually relieve an attack of cramp. Most cramps soon ease off. Painkillers are not usually helpful as they do not act quickly enough. However, a painkiller such as paracetamol may help to ease muscle discomfort and tenderness that sometimes persists for up to 24 hours after a cramp has gone. 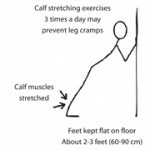 To stretch calf muscles, stand about 60–90 cm from a wall. Then, keeping the soles of your feet flat on the floor, bend forward and lean on the wall. You will feel your calf muscles stretch. Do this several times, each time for as long as you can manage. It may take a week or so of exercises before you notice an improvement. 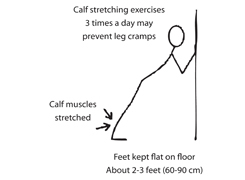 So, it is worth giving yourself a 2–4 week trial of regular calf stretching exercises to see if your cramps ease off. The cramps may not go completely, but their frequency and/or severity may reduce. If you take quinine you have a good chance of reducing the number and/or severity of leg cramps, but it may not stop them altogether. One tablet at bedtime is the normal dose. Most people can take quinine, but do not take it if you are pregnant or may become pregnant. There are also some rare conditions where you should not take quinine. These include: a previous reaction to quinine; a previous haemolytic anaemia; optic neuritis; glucose 6; phosphate dehydrogenase deficiency. Side-effects are uncommon at the low dose used to treat leg cramps. However, serious side-effects do sometimes occur. For example, a serious blood disorder which is potentially fatal is a known rare side-effect. Also, a small number of people who take quinine long-term develop a condition called cinchonism (a complex of nausea, vomiting, dizziness, visual disturbance, and hearing impairment). Note: quinine is dangerous in overdose, particularly in children. Keep tablets away from children. When quinine is first prescribed it may be done on a trail basis for 4–6 weeks you should be aware of the small risk of serious side effects. Also, it is best to objectively assess how well the quinine works. For example, by keeping a sleep and cramp diary. Ideally, this should be for a few weeks before and after the start of treatment so as to gauge its effect. 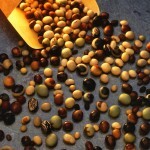 If quinine is found to help then you may be advised to continue with it for a few months. You should consider stopping quinine every three months or so to see if it is still needed. This is because in some people the cramps go away and so the treatment may no longer be needed. If the cramps return, you can always re-start the tablets.